Dan Schawbel's Promote Yourself will be out this week. Thank you to Dan Schawbel for being a Chrome Sponsor in The 7th Annual JobMob Guest Blogging Contest. This is Dan's 4th time sponsoring the contest! Hot on the heels of his first book Me 2.0, my long-time friend and career blogging colleague Dan Schawbel will be releasing a new book this week: Promote Yourself. Promote Yourself: The New Rules For Career Success, written by career expert Dan Schawbel, frees you from the outdated rules for getting ahead and lays out a step-by-step process for building a successful career in an age of ever-changing technologies and economic uncertainty. By basing your personal brand on the rock-solid foundation of hard, soft, and online skills that are essential to get the job done right and by knowing exactly what managers value, Schawbel provides you with the unique skills and message that you’ll need today and for the rest of your career. I haven't read it yet, but I don't need my incoming review copy to know that this will be one of the best career books to come out this year. That said, I will follow up here later with my thoughts on it. 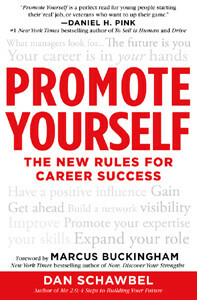 Promote Yourself: The New Rules For Career Success will be released on September 3rd in hardcover, audio and Kindle editions. Thank you to Dan Schawbel for being a Chrome Sponsor in The 7th Annual JobMob Guest Blogging Contest. Please support and recommend him. Indeed, as times change, so does how people see other people, and most importantly on the work topic, how managers see workers. Somethings will never change and will always be important like a firm handshake, but other personal ‘output’ needs to adapt to the times and a lesson from technology cn be learnt. Look at facebook and take a hint. We all have hundreds of friends, but we can’t handle the news from everyone so FB created an algorithm that will mainly send you news from friends it thinks are more important to you. If you do not interact with a ‘friend’ or a group, you will not see their news in your feed (even though they might be active users). But even just one comment on a status update of theirs will automatically raise a flag sending you their status updates and activity to your feed. How do we take that to the workplace? Well, managers are being bombarded with information from different sources. If you do not maintain good interactions with them, then you fall off their scope (news feed). You are still there, but they are mainly seeing news from other people. I love the book trailer. Congrats Dan. Dan is incredibly productive. Just how many books has he written?